It’s no more news that Glo 0.0k unlimited free browsing cheat is blazing back, but with a different proxy server.I will be introducing you to a new VPN app called Sky VPN. 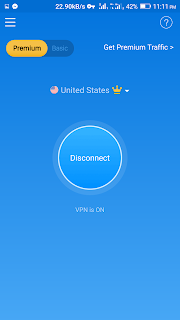 This VPN is a standalone VPN app that doesn’t depend on any special settings or proxy server. With this VPN, you will never experience any form of disconnections again. The downside is that it is limited to some data usage (i.e you will have to be a premuim user before you can have unlimited usage). Sky VPN app – Download Here. Like i said earlier, there’s no special settings on this VPN, but you will be limited to some data usage, until you become a premium user. open it, Then click on the menu icon at the top left corner. Now click on Premium Traffic and tap the Daily Check-in to get free 75MB data. Tap I’m Feeling Lucky to get free 25MB data. Now, go back to the app main page, and tap on Premium button, a pop up message will ask if you want to upgrade, click on Upgrade and choose United States as your region. Now tap on Connect, wait for about 60 seconds for it to connect and you’re good to start browsing. You will never experience any form of disconnections again. If this post really helped you, please leave a comment below and don’t forget to use the share button below.